Ultra-comfortable fit and on-trend style, our Olanda sandal has it all. 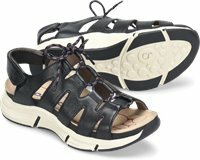 This versatile sport ghillie sandal is easily adjustable so you can get out, get moving and hit your stride. I normally where are size 9 1/2 wide or 10 most my shoes are in a 10. I ordered these in a 10 and at the arch it was way narrow and short on length. I sent them back and got a size 11 because I love the shoe so much and with tightened up adjustment I’ll be able to wear these I just think they’re super cute and I think I can make them work I have two other pairs of bionic it and they fit wonderful ...I was very disappointed with these. My main problem with this and some of the other shoes I've ordered is that the fit is too narrow - even with this apparently adjustable enclosed upper. I think the foot bed design is the problem. Not only were my toes squeezed (and they like some room to breathe! ), it seemed to keep the foot bed from cradling my foot the way I would expect in a comfort shoe. Too bad -- I really liked the style! I have several other shoes from bionica and am in love with them. However, this shoe is not comfortable. They sit in my closet as I can't bring myself to put on shoes that are not comfortable. I have other walking shoes that are ten times better. Sorry I bought them. First, it fits true to size. Second, I bought this because the Veridas style fits me perfectly (Veridas 7M fits my 7.5W feet perfectly, and for a hard shoe is SO COMFORTABLE). But this 7M is a bit too narrow for my feet. They are good looking, but won't become my go-to casual comfort shoe. Sporty walking sandal, feels like sneakers. My go to walking sandal! Curves perfectly to my foot and feels amazing. Very light and love the color! Thinking about buying in black too, or Bionica has another sandal that's very similar I would like to try.